If you are looking for a safety gate that you can move around the house – i.e. install at different portions of your house according to your need – then what you are actually looking for is the Safety 1st Wide Doorways Fabric Gate. This lightweight and plastic safety gate is perfect to install and remove, and reinstall when the occasion calls for it. This plastic yet sturdy safety gate can be carried around the house – inside or outside – or even travelled with, if necessary. It takes any individual merely seconds to remove the gate from where it was installed and put it in another place without the need for any tools or too much pressure. Therefore, it is possible to use the same gate for a number of houses, rooms or locations instead of buying a number of them. 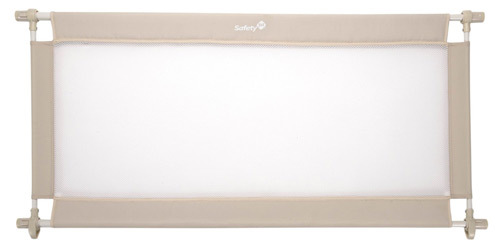 The Safety 1st Fabric Gate – with its attractive design and neutral color – is a perfect choice of safety gate to be used in hallways, doorways and between rooms and furniture. The subtle color of the gate blends easily with any décor inside the home, and don’t usually clash with the interiors. The gate stretches and covers any opening as wide as 60 inches, and stands 27 inches high. For a family who is used to travelling, or for families that spend the weekends and holidays at ‘grandma’s house, the Safety First Wide Doorways Fabric Gate can be perfectly travelled with, to be fitted in any location without having to buy another gate for a different house. Since the gate is mainly fabric, it is machine washable and easy to clean. The model comes with a special drawstring bag for storing or transporting the gate easily. 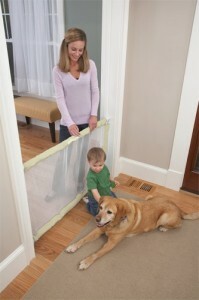 The fabric is also strain resistant, and easy to remove from its binds with the gate. It is extremely easy to install and re-install the gate again and again, and anyone can do the job in a matter of minutes, if not seconds. There is no door in this gate; adults would have to cross over the gate, or open one side to pass. The gate may keep the children safe and protected, but it is certainly difficult for the parents to move across the gate in a hurry. Also, because the gate is mainly installed and reinstalled a number of times – sometimes, a number of times in a day – the pressure mounted cups that hold the gate to the walls may loosen over time, making it easier for children to be able to open the gate – thus eliminating the usefulness of the gate. Besides, there is no provision for a family to use two of the same gate to fit an opening larger than 60 inches. Both end of the gate needs to the attached to the walls, and there is no stipulation to attach one side to another similar gate.